Since time immemorial, cycles have been a very important mode of transport. They are used for various purposes, from acting as a “business hub” in terms of acting as a point-of-sale for tea vendors to the main business vehicle in rural areas. They are used as the main transport vehicle by many, especially in rural and semi-urban areas. In urban and metropolitan areas, they are viewed as a lower class mode of transport. Cycles acting as a Business Hub. A vegetable Vendor in Sathyamangalam, TN, uses his cycle as his shop. Image copyright Srikanth Ramakrishnan, CC-BY-SA 3.0 Unported, available on the Wikimedia Commons. In the recent past, several cities in India have tried to popularise cycling in several ways. Among them are Pune, Bangalore and Ahmedabad. While some have succeeded and some have failed, it is worth relooking at cycling for the various benefits it offers. 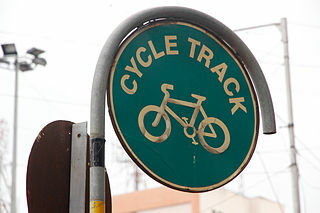 A board indicating a Cycle Track in Pune. Image copyright Mahendrapatnaik, under the CC-BY-SA 3.0 Unported licence on the Wikimedia Commons. Pune got cycle lanes around 2008 while the city got a massive overhaul for the Commonwealth Youth Games, under the JnNURM pattern. A few cycle tracks were laid in and around Kothrud and Shivajinagar, while majority of the cycle lanes were laid from Katraj to Swargate to Hadapsar alongside the first BRTS line. These cycle lanes are usable, but they are usually blocked by traffic, pedestrians, or sometimes, hawkers and homeless people. Bangalore got cycle lanes in 2012. These lanes are prominent in and around Jayanagar, especially under the Metro. These lanes were basically just a section of the road marked with a solid white line with the image of a cycle painted on it, thus not having a physical barrier separating it from regular traffic like the ones in Pune. The net result, they turned into parking spaces for cars. Mysore too got cycle lanes, but unlike Bangalore, they were physically separated from motorised traffic. However, a year prior, in 2011, prior to the opening of the first Reach of Namma Metro, Bangalore also got a Public Shared Cycle system, jointly operated by the BMRCL and BBMP. The system was operated by Kerberon Automations under the brand name Atcag. Each cycle was tracked by GPS and required users to pay a one time registration of ₹1000 for a smart card and then use the card as a prepaid card while using the cycles. The first hour was free, after which a nominal rate would be charged. There were 9 cycle stations in the city. Ahmedabad got a similar system named MyByk, operated by Greenpedia, with cycle stations across several Janmarg stations. Cycles for use by everyone inside the Infosys Mysore Campus. Image copyright Prateek Karandikar, CC-BY-SA 4.0 Unported, on the Wikimedia Commons. Now, the success of the public share and ride system is entirely debatable, mainly due to the subscription based nature of the service. The system followed in IT parks like Infosys, or college campuses like the IITs, where a cycle is picked up from the stand and left in another is impractical in public because cycles will get damaged or stolen because the rider is not being held accountable for their actions. Thus, the system of charging users and tracking the cycles, both with GPS and tying it to a user is a necessity. Now, the main section. How do we implement an effective cycling plan across major cities. For this purpose, I plan to use the Pune Metropolitan Region of Pimpri-Chinchwad and Pune, as well as a part of the Mumbai Metropolitan Region consisting of Mumbai, Navi Mumbai and Thane. Creating cycle tracks and lanes is one thing, but making it safer for cyclists is more important. Cyclists are on par with Pedestrians. Both are treated badly and often traffic doesn’t bother stopping for them, even with the appropriate traffic signals showing. Our first target, the PMR. The Pune Metropolitan region offers immense potential for cycling as a mode of public transport. This, coupled with the fact that Pune has been the undisputed Cycling Capital of India for a long time makes one wonder why the government has not done much to promote cycling. For starters, all the BRTS corridors, from Nagar Road, Nashik Road, Aundh-Ravet Road, Vishrantwadi Road, et al must be given proper cycle lanes. Once this is done, cycle parking must be provided. This can be easily achieved at major bus terminals such as Kiwale and Vishrantwadi, but needs to be given a serious thought at other areas. It can be done with relative ease at Kalewadi Phata and Dange Chowk, both of which have a split flyover, providing the much needed space for the parking. Similarly, parking must be offered at major PMPML bus stations, such as Kothrud, Balewadi, Nigdi, Chinchwad, Corporation, Pune Railway Station, Swargate, Hadapsar, etc, as well as Railway stations like Shivajinagar, Kasarwadi, Akurdi etc. Along with this, last mile connectivity should be provided for those using shared cycles. Docking stations must be provided in residential pockets to encourage their use. And now, for the MMR. The situation in the MMR is pretty similar to the PMR. Cycle stations can be provided at all of BESTs Depots, Bus Stations, major junctions such as Rani Laxmi Chowk, Khodadad Circle, Dr. Shyama Prasad Mukherjee Chowk, NSCI Worli, as well as under the various rail-based stations. Cycle stations can be built around the Railway stations as part of SATIS, or under Metro and Monorail stations on the Median with an additional staircase of elevator for cyclists to use. In Thane, Navi Mumbai, it can be implemented along several select areas near Hiranandani along Ghodbunder Road, and at all CIDCO railway stations. It would be a massive boon to have it at CBD Belapur Railway station given the connectivity it will soon receive. A cycle station can be set up under the CBD Belapur flyover as well. Similarly, stations must be built at all present and upcoming Jetties, Ferry Wharf, Gorai Jetty, Belapur Hoverport, etc. Other major areas where they can come up are at SEEPZ in Andheri, Powai, etc. Both these cities should seriously consider providing cycle stations at bus stations, railway stations and Metro stations. This might help fulfill the BMTC Park and Ride Concept. Ideally, each ‘Cycle Station’, should consist of two parts: One for the public cycles, and for people riding their own. The former is not a problem, since each user requires a Smart Card. Thus, authentication and security are sorted as both are connected to the card. The Old Fashioned Way: Hire a guard or attendant. He gives you a receipt for the parking charge, you park it in the stand, lock it with your own lock and go. You can have a pass system for this. For those who don’t have a lock, provide one against payment of a refundable deposit. Say your parking charge is ₹20 for a day, you charge ₹50 for a chain and lock, upon whose return, you get your money back. You can have a daily-weekly-monthly pass system for this as well. It’s a win-win situation. Print the cyclists photo and a photo of the cycle, specify the date and time details for the pass on a sheet of paper. Just cross the date if it is a daily pass being sold by the vendor. It is as simple as a conductor selling a ticket. But do we really want to go down this path? Especially with Digitisation and eGovernance coming up? The High-Tech Way: Install cameras for security, but yes, do hire a guard. Every user needs to have a smart card, for single transactions, they can get a token or a single use paper RFID token. The user comes in, locks the cycle with a lock built-into the stand, swipes their card on the sensor and leaves. The money for the parking is deducted from the account balance of the card. For the ones who don’t have a card; keep a machine like the Automatic Ticket Machines at Metro Stations. User slots in the time they intend to park for, insert the money, collect the RFID token or printed ticket, lock their cycle and go. On return, they return/slot-in/swipe the card or token and take their cycles out. This can be a good starter with the BEST prepaid card as the Smart Card. There is a lot of thinking, planning, redrawing, mapping, innovating to be done to implement this. This will potentially improve and increase the number of cyclists on the roads, which might help reduce traffic jams. We all know how healthy and enjoyable cycling really is. Let us share the joy with those who may not know.